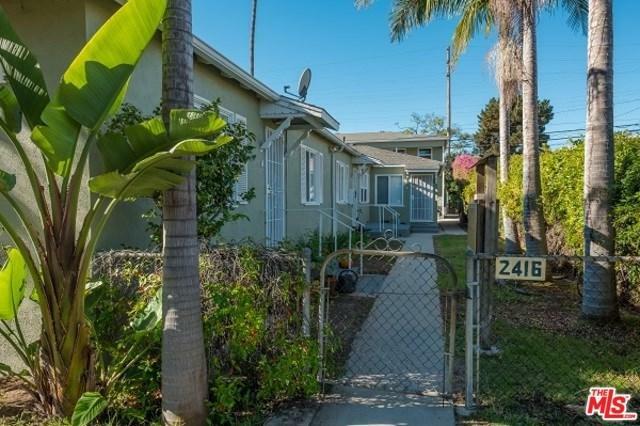 We are pleased to present 2416 20th Street, located in the prime Sunset Park area of Santa Monica. The offering is a fantastic 5 unit opportunity with an incredibly low GRM of 15.53 and outstanding Cap Rate of 4.37% on current income with additional upside in rents! The property is located less than two miles from the beach and within walking distance to some of the most desirable retail, shopping and dining in the country; Main Street, Ocean Front Walk and Abbot Kinney just to name a few. 4 of 5 units have been renovated throughout with much of the following: granite counter tops, windows, stainless steel appliances, hardwood floors, water heaters, recessed lighting etc. Units A, C, D & E were redone with copper plumbing, roof and windows. The offering sits on 7,161 square feet of land with a rentable square feet of 3,076 and consist of 2 one-bedroom/one-bathroom units and 3 two-bedroom/one-bathroom units. Sold by Filip Niculete of Marcus & Millichap.